RAW HOLLYWOOD : NEW MUSIC: DJ TRENDSETTER FEAT. 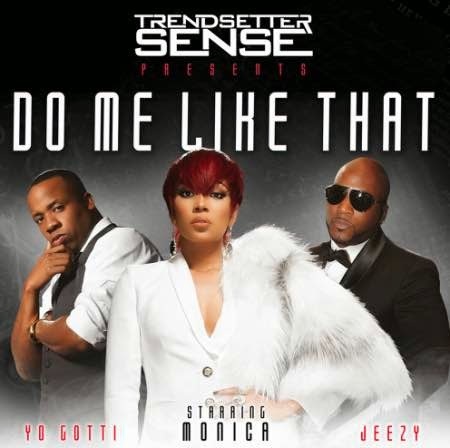 MONICA, JEEZY & YO GOTTI "DO ME LIKE THAT"
NEW MUSIC: DJ TRENDSETTER FEAT. MONICA, JEEZY & YO GOTTI "DO ME LIKE THAT"
Popular Atlanta DJ Trendsetter has collaborated with singer Monica for a new record entitled "Do Me Like That" & it's features verses from Jeezy & Yo Gotti. Monica puts her man on front street for all of the bulls**t with his player way, Gotti flaunts his girl for being a bad b***h & Jeezy treats his special lady like a queen.